Who wants to be normal? Not me! 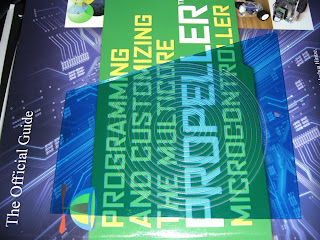 I recently got my Zen Toolworks CNC machine built and hooked up using stepper drivers and breakout board from Probotix. Today I did my first cut! I used EMC2 and cut a spiral into a small piece of plastic. I still need to add limit switches and figure out how to make my own designs to cut, but at least it works. 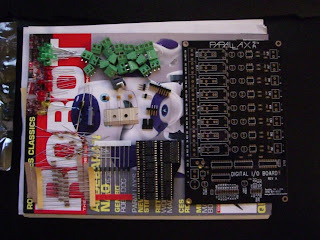 I recently got a Parallax Digital I/O Board. It comes in kit form. So you have to solder all of the parts into place, but it is all through-hole. Here's most of the parts before I started. I have 8 relays not shown in this picture. And here's the finished product. Sorry, no pictures of it during assembly. Top view. 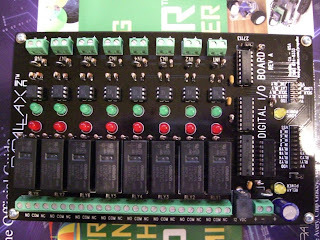 I think this is a really cool looking board. Bottom view. 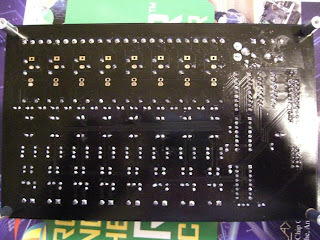 You can see that I am not an expert at soldering, but I got the job done. I've done some basic testing and it all appears to be working fine. Just a quick update to point you at another video I just uploaded. I added a IR detector and an XBee module. They're on a breadboard for now. Just so I could get it functioning. I coded it so I could drive the robot around using a tv remote and it reports move and turn commands back to my PC via XBee. I have another XBee module hooked up to the PC via USB. 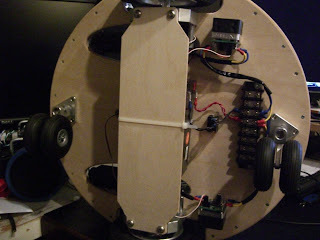 The wood platform robot is alive! I finally got the wood platform robot running today. This is an picture of the top of it. You can see the 10 PING))) sensors, the 20x4 LCD display, and I have a 7.2v R/C car battery powering the MSR1 board. Here's the bottom. 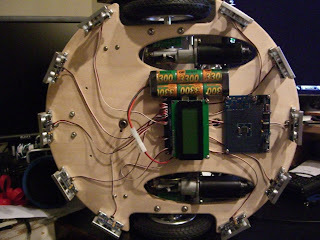 You can see the 2 HB-25 motor controllers and the 12v battery that is powering the motors. I'm currently holding the 12v battery in place with a large zip-tie, but I want to figure out something better. I put a video of the first run of this robot on youtube here. So, I have been slacking a bit on updates here. Part of it is because it's rained the last 2 weekends so I couldn't work on the backyard project, and I haven't done as much on the chainmail as I would like so I didn't want to do an update with only a little more on it. I have also been working on a new project (CNC machine) that I will post an update on tomorrow. I hack therefore I am. This blog is just going to be random stuff about whatever. These postings are mine alone, have not been reviewed or approved by Daybreak Games Company ("DGC"), and do not necessarily express the views of DGC. LIVE Robot Party’s @ RoboGames! Morning Wake Up Call...or Cry.